We are thrilled to announce our conference keynote. 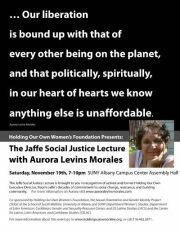 Please join us after the Engaging Feminisms conference, from 7 – 10 PM in the SUNY Albany Campus Center Assembly Hall for The Jaffe Social Justice Lecture with Aurora Levins Morales. The Jaffe Social Justice Lecture is brought to you in recognition of activist and former Holding Our Own Executive Director, Naomi Jaffe’s decades of commitment to social change, resistance and building community. Aurora Levins Morales born in Indiera, Puerto Rico, to a U.S.-born Puerto Rican mother and a Jewish father is a lecturer and a social activist deeply concerned with issues affecting third world people and most especially women. As a Puerto Rican writer Levins Morales deals with her Puerto Rican identity from a global perspective. Recurrent themes in her works and essays are sexual abuse, racial discrimination but also ecology and social justice. She shares with many other US women writers of color her use of hybrid forms (prose and poetry), mixture of personal and collective voices and the importance of a female ethnic heritage in the development of a female voice. For more information on Aurora visit http://www.auroralevinsmorales.com/. Co-sponsored by Holding Our Own Women’s Foundation, the Sexual Orientation and Gender Identity Project (SOGI) at the School of Social Welfare, University at Albany and SUNY Department Women’s Studies, Department of Latin American, Caribbean, and US Latino Studies (LACS) and the Center for Latino, Latin American, and Caribbean Studies (CELAC) and the Gender and Sexuality Resource Center. For more information, see our Facebook Event page, or call 518.462.2871. This event is open to the public.